I just found out that Mac Tonnies died on October 22nd at age 34, apparently from natural causes. From what I've read online, his book about his cryptoterrestrial theory was finished and should be published. I'm still in shock from the news. I first encountered Mac's work through his blog, Posthuman Blues. Unlike others in ufology locked into the ETH mindset, he was looking for answers beyond the “same old same old.” His voice will be missed. Other posts about his passing can be found here and also here. For one day exercise gave way to X the unknown. Saturday, October 24th, 2009. The City of Plattsburgh Recreation Center welcomed psychics, ghost hunters, healers and others involved in the paranormal. 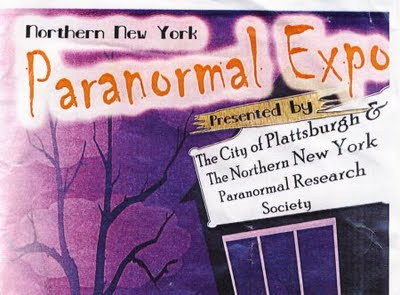 The Northern New York Paranormal Expo was co-sponsored by the City of Plattsburgh and the Northern New York Paranormal Research Society. The setting for the vendors was a bit unusual: a gymnasium. The building was once the recreation center for the decommissioned Air Force base. Tables were lined up in neat rows on the gym floor. The basketball hoops were raised up, out of use for the day. Up above ran a second story track along the walls, a jogger doing laps while people waited in line down below to consult with a psychic. Muscles and minds. Other tables featured girl scouts selling Halloween cupcakes, an author with copies of his book for sale (“Saviors Among Us: The Story of a Northern NY Superhero”), recycled Halloween costumes (“Think Green”), and the usual unusual, from herbal remedies to crystals. One table was manned by members of the NNY Paranormal Research Society who explained the tools used in their investigations (mostly hauntings). A laptop computer featured a screen with frozen green waves: most likely an example of EVP (electronic voice phenomena). One researcher demonstrated how a EMF (electro-magnetic field) meter worked, one of the tools in the ghost hunting trade. Two compact dgital cameras stood side by side on a small tripod; one had been converted to record images in the infra-red range. I arrived late in the day but from what I saw the event was well-attended. One factor that helped: it was set up for the whole family. Fun for children 12 years old and younger, according to the brochure, included a Witches Hat Ring Toss, Bite the Witch's Apple, and a Cauldron Toss. There was a “haunted city morgue” installation that came with the warning: “The Haunted House could be too scary for some children. Please inspect it prior to allowing children to enter.” I didn't see any crying kids. And with all of that activity upstairs, downstairs was set aside for guest speakers. I'll comment on that part of the PExpo (as I call it) neXt time. In my previous post I mentioned Jim Moseley's Saucer Smear. There's another old-fashioned UFO zine out there, Flying Saucer Digest, published by Rick and Carol Hilberg. FSD offers a round-up of UFO stories collected from various sources. Two dollars to R. Hilberg Publications, 377 Race St., Berea, OH 44017 should get you a sample copy. They also publish another zine featuring Fortean items, Weirdology. Rick is still recuperating from a bad fall. He mentioned in a recent postcard that he's walking around with a cane and going for physical therapy, but he hopes to be able to walk by the end of the year. I've never met Rick and Carol in person, only have corresponded with them via e- and snail mail, but they have always been helpful. Despite his setback, Rick is still publishing his zines. 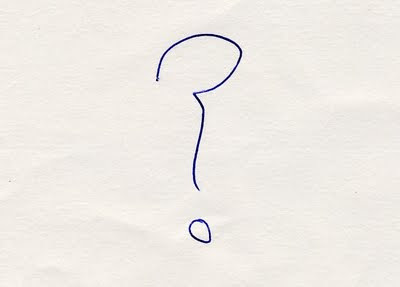 Besides the latest issue of Saucer Smear, I found an extra item in the envelope from Supreme Commander Jim Moseley: a white card with a big question mark scribbled on it. No, it wasn't a secret Illuminati message. Jim hadn't heard from me in a while either by snail mail or by phone. Of course, yours truly hasn't eXpired – at least not yet. I'm reusing Jim's question mark to illustrate this post. Why? The lead essay in the last edition of Saucer Smear (Whole Number 425/Oct. 15Th, 2009). In his RAMBLING EDITORIAL Jim talks about having “grim thoughts” at age 78. He mentions that “Sooner or later, your editor will have to cease publican of 'Smear. '” It had been announced that someone was in line to take over SS – but that circumstance has changed. There is no new editor set to continue his zine. Dr. Chris Roth had volunteered to take controls of the starship but has reconsidered his offer. As Jim explains in his essay, Roth considered his financial needs and decided not to assume the mantle of Supreme Commander. Jim says he feels no ill will about this change. Fans have pointed out that Jim IS Saucer Smear and that no one can take his place. What I like about SS is that Jim stills puts it together with a typewriter, scissors and some tape. It harkens back to the early days of fanzines where the writer would fix the text post paste-up with a black pen. Corrections printed in the margins, the mistakes crossed out. A couple of underlines for a spot to ink in a page number since the editor didn't know where an article would end up (e.g., See details on Page __ .). I must say I can't keep up with Jim's output. SS keeps showing up in my mailbox many more times than my zine is mailed out. At 78 Jim has more energy than yours truly. So while the future of Saucer Smear is uncertain, at present it's still going strong. For ufology with a personal touch, send a couple of dollars to Jim Moseley, PO Box 1709, Key West, FL 33041. Is There Only Death After Life? One reason why I enjoyed this book: that snarky (ex-)Catholic girl tone. Sarcasm that an ex-Catholic like yours truly can really appreciate. 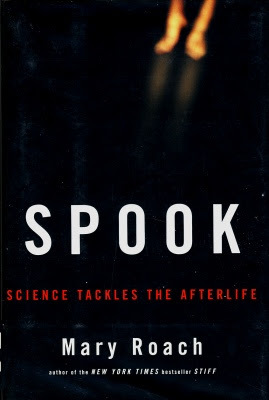 As Mary Roach explains in Spook, her early years were steeped in Catholicism, her mother reading the Bible to her at bedtime. But as she grew into adulthood, science provided better answers than religion. For example, maybe the Lazarus story was just a case of premature burial; nothing miraculous happened. But Mary doesn't embrace science with blind faith. As she observes: "Of course science doesn't dependably deliver truths. It is as fallible as the men and women who undertake it... Flawed as it is, science remains the most solid god I've got." In her book she pursues the question: Is there a soul separate from the physical body that lives on after death? Or, to put it in a nutshell, are ghosts real? So soul searchers tried at find proof at the other end of the scale: death. And this work literally involved a scale. the Consumptives Home in Dorchester, Massachusetts, he rigged up a special cot to place a patient dying from tuberculous. In turn the cot was hooked up to a scale. MacDougall noted there was a loss of three-fourths of an ounce after the patient passed on. Ergo, the difference in weight had to be the soul leaving the body. Critics of MacDougall's research had other explanations, e.g., the difference was due to the last breath of the patient being expelled. At this point in the story Mary Roach's makes a snarky Catholic girl comment regarding MacDougall and the other physicians watching the man on the cot-scale dying for three hours. She writes: "In place of the more usual bedside attitudes of grief and pity, the men assumed an air of breathless intent expectancy. I imagine you see this on the faces of NASA engineers during countdown and, possibly, vultures." Bring her story up to modern times, Mary takes a trip to the Consciousness Research Lab at Laurentian University in Sudbury, Ontario, Canada. The director of the lab, researcher and neuroscience professor Michael Persinger, has a theory about ghost encounters. His believes that electromagnetic fields, such as those created by geomagnetic activity, induce a haunting in a person's brain, specifically the sensation of being watched by an invisible presence. Persinger wires up a Mary with a special helmet that exposes the subject to an electromagnetic field. She waits for a ghost to appear. What happens, like the other incidents during her research, is inconclusive. But despite questions leading to nothing positive, Mary finds the answer to the question of life after death -- her own answer. It's amazing how a small project can eat up so much time. After all these years publishing a hardcopy zine, you would think it would get easier. Nope. First, write enough material for an issue. Paste in all that text to fit. Then proofread, print a master copy and then go the the printshop to make photocopies. Compare that to publishing a blog: write, proofread, push a button, you're done. I started this journey with my zine, the Ray X X-Rayer. In the beginning it was fun, learning how to paste up a zine using a computer. Playing around with different lay outs and fonts. Now the whole hardcopy gig is a pain. 1. I like getting zines via snail mail. Easy to read, no batteries needed. 2. If all of my digital stuff vaporizes, I still have hardcopies. 3. Some Luddites still eschew the Web. But despite those reasons, my zine might be going the way of the dodo bird. It might live on in other forms online, a PFD file or Word document, available at my Website, xrayer.com . And that leads to another item. Since I now have DSL, I'll be dropping my poky dial-up service. That means that xrayer.com needs to find a new home because the dial-up company has been hosting my site. But I've been working on that angle. I just put up a new site, rayxr.webs.com, that will take over. I will eventually have xrayer.com redirect to that location so that I have a place to archive my zines. The new site is small; it only has the XR issues for this year for download. The latest issue, XR #66, is there in both PDF and Word document formats. Be advised that my zines are now posts collected from this blog. So the material isn't new. Another reason why I might drop my zine. Why recycle stuff for only a few meatspace readers? But if you're online, still into zines, and don't want to scroll through this blog, then you can print out your own at my Website. If I I get enough feedback, I might continue with zining, at least online. I'm sick of the taste of envelope glue. Where's my DSL installation kit? I'm walking around my neighborhood at night, looking for the box that didn't arrive at my door. I had signed up for the faster internet connection because I want to save time. For years I had tolerated a poky dial-up connection, a blazing 48 Kbps. But thanks to that poky dial-up connection, I found out that the box had been delivered earlier in the day, according to the UPS tracking site. I assume it was dropped off at the wrong address. No sign of it in the neighborhood, at least in the dim lighting. A phone call to UPS after my useless neighborhood search. I find out the package was delivered to my building but to the wrong apartment number. This pisses me off because I had the DSL service company repeat back to me on the phone my address when I placed the order. The wrong apartment has a separate entrance way that I had assumed was always locked. The package isn't outside that entrance way. Someone might have grabbed it. By chance I bump into the building manager in the hallway – this is around 12:30 AM, he's also a night owl – and I explain the situation to him. He tells me that the entrance way to that section isn't locked. Guess where the package has been hiding. I get the package, carefully read the directions, and hook everything up. But unlike a simple dial-up connection, the DSL kit is a somewhat involved set-up with filters that have to be placed in the right spot. I make sure to follow the diagram, double-checking each line and filter. This takes some time because I have two telephone outlets behind furniture. Everything seems ready to go; I try to connect via DSL. Nothing. Eventually I locate the problem – a loose connection. Then I screw around with some other niggling tech problems. Time saved with locating my kit and getting it up and running – five hours. So how much time am I saving now with DSL? Last night I tried to leave a comment at someone's Blogspot site. Suddenly the link to that site disappears. I soon discover that any site associated with Blogger.com won't open up, even though other sites will. Again and again I try to figure out the problem. I'm getting pissed; besides leaving the comment I also want to post on my Blogspot site. After going in circles, driving myself crazy, I finally find a way to link back up with Blogspot sites. I close the DSL and hook up with poky dial-up. While slow, the dial-up works. So in case you've been wondering why I don't post that much, it's because of all of the free time bestowed upon me by computers. I have so much free time I don't know what to do with it.